Working on any construction or demolition project can be a difficult thing. There are so many questions that need to be answered. Such as, what do we do with all of the waste that's left over? Now that we've got everything cleaned out what do we do with this old carpet? If you are in South Bend Indiana or the surrounding area we have the solution for you. Contact South Bend Junk Removal and let us be your carpet disposal service. Our staff is courteous prompt and our fees are fair. Compare us to other carpet removal and carpet recycling companies in the area and you will see that we are the best. 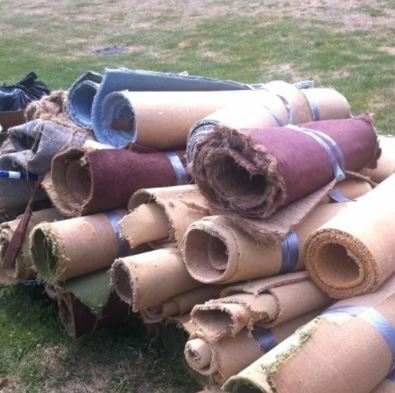 let us save you time, money, and the headache of trying to figure out where to dispose of carpet. Old carpet can be heavy and cumbersome. Disposing of it can be very difficult especially, if you're not sure where you can take it. We have the solution for you. Let us take it!If you don't have an entire building full of old carpet give us a call anyway, let us figure out how we can help you. We specialize in waste management of all shapes and sizes, and cover everything from recycling old appliances to garbage hauling. Let us show you why we are the king of junk removal in South Bend Indiana. We guarantee that our friendly staff will make the process easy for you. Give us a call today. Let us know the size of the project and what you think you're going to need. Let our experts go to work for you. We will get the job done in a quick professional manner. you will not be disappointed. If you have already completed your project and have all that carpet laying around the job site, or your yard give us a call. We will come by and pick it up quickly. Don't feel bad about it. We completely understand. We have been in the business for a long time and there is no job that is too big or too small for us to handle. Our carpet disposal service is sure to put a smile on your face and be less expensive than you might think. Why rent or lease equipment to haul away all your old carpet in the remnants? Equipment is expensive, fuel cost and labor are expensive. ​Save time and money by giving us a call today! We service the South Bend Indiana area and we are the best of what we do. Compare us to other carpet removal companies and you will see that we are the best! So when you are working on your project or cleaning up the neighborhood keep us in mind for all of your junk removal needs no matter how big or how small South Bend Junk Removal is the answer. We want your business check out our site give us a call and let us show you what we can do. If you have friends and family that are working on projects, send them our way. South Bend Junk Removal is sure to get the job done right the first time!